DIY Ladder Bookshelves - Everybody Repurpose Tonight! Repurposing -- reusing old things in imaginative new ways -- is great for the environment. It also gives you a bargain-price opportunity to custom-build a piece that will be uniquely yours. And when it comes to repurposing, the design potential of an old ladder is unlimited! Start with our suggestions for easy DIY ladder bookshelves; then move on to other fabulous old ladder ideas. Disassemble an old wooden ladder and use its parts to build a rustic-chic shelving unit. 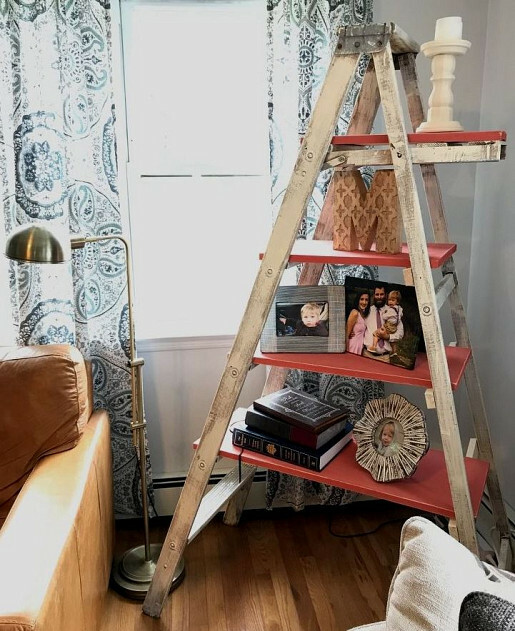 Upgrade a little stepstool ladder in a sunny shade of paint and you’ll end up with a repurpose that’s as cute as can be. It’ll be totally transformed … into a darling spot to display your precious knick-knacks. This concept is nothing less than brilliant! Here are two fantastic repurposing ideas. In the bedroom, repurpose your old ladder as a vertical shoe or scarf storage rack. Tip for the ladies: your heels will hang perfectly on the ladder's steps. Bathroom storage space is so valuable. Why not take advantage of vertical wall space by hanging towels on a ladder? You get the look of built-in towel racks, without needing advanced skills in carpentry. If you’ve got some vertical space in your laundry room to spare, a hanging ladder drying rack makes perfect spatial sense. Clothes on hangers can dry, suspended from the horizontal ladder. This old ladder hack is a super space-saver! Now here is a way to add romantic yet offbeat rugged charm to your bedroom. You can build a demi-canopy over your bed with an old ladder. How quirkily chic! Let’s say that you have no trees in your backyard (or you have no backyard! ), but you really, really want to look out your window and see flocks of wild birds feeding. Old ladders make perfect stands for birdfeeders and birdhouses. Sawhorse tables -- for work or play -- are certainly a style statement, particularly when old ladders form the base. This ingenious, fun desk gives you lots of room to write. It’s also a way to upcycle all kinds of discarded wood: an old ladder, sawhorses, and pallets. Or whip up a repurposed DIY coffee table from a couple of small stepladders, topped with glass, metal, tile, or salvaged wood, whatever material strikes your fancy. This is my favorite use for an old ladder. Just add plant containers on the rungs, to create a pop-up small-space garden. I love how space efficient and simple this vertical gardening concept is. It would work inside and outside, and is so much less expensive than those prefabricated vertical garden supports. No time or tools to do it yourself? No problem. Contact a talented carpenter to make your funky furnishing vision come to life.